WebDav (Web-based Distributed Authoring and Versioning) has become an industry standard for web authoring. It is a new Internet specification that extends the HTTP protocol. 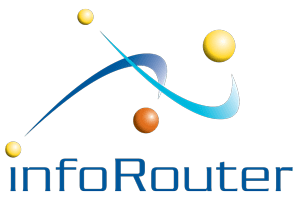 The infoRouter WebDAV Server is an integrated platform that allows users to bypass the infoRouter interface and collaboratively edit and manage files and documents on remote servers directly from their desktops. Users will be able to upload new documents, view documents, drag-and-drop new documents and export documents simply by using the standard Windows File Explorer or a standard Finder window from a Mac. Users can directly open infoRouter documents from within the Windows File Explorer. With WebDAV compatible applications such as Microsoft's Word, you will be able to simply double-click on MS Word documents, make changes and hit the save button	to directly save documents into infoRouter. Even version control is supported. The infoRouter WebDAV Server is fully compliant with RFC 2518 as defined by WebDAV.org. For more information and useful information please visit the Official WebDAV Website. Using the infoRouter WebDAV platform, content can be directly authored and edited by authorized users without having to use a specific interface. It eliminates the need to use outdated and somewhat complicated tools such as FTP. Platform independent. A Windows, Mac or Linux desktop user can publish content into the infoRouter WebDAV Server. Edit documents easily but clicking on them. No downloading of documents.